The engines of Sir Topham Hatt's railway family. These are the 8 main engines that work Sir Topham Hatt's railway. Each have their own personality, favoured jobs, and good friends in each other. Thomas is Sodor's Number 1 tank engine. He is a 0-6-0 E2 class tank engine and arrived in 1915 to help build the railway and stayed on as a pilot at Tidmouth and Vicarstown. Thomas got his own branchline with two coaches after he helped James from an accident. He is cheeky, but a hard worker, and in the Fat Controller's eyes, is a Really Useful Engine. After crashing into the stationmasters house the front of his footplate was made straight. Thomas has traveled beyond Sodor; in 1991, he was sent on a tour of the National Railway Museum of York, where he met several famous engines and became an honorary member. He only trusts the engines on his branch with his faithful coaches Annie and Clarabel. Being the oldest and wisest, Edward recieves a lot of respect from the other engines. He is a 4-4-0 Sharp Stewart Larger Seagull loco built in 1896. He arrived on Sodor from the Furness Railway around 1915 to help with the railway's build and got his own branch line. The smaller engines, Bill and Ben especially, find him a threat when angry, and also are keen to do as he says. Much age comes before beauty, as Edward is often tired and moving slowly nowadays. But nevertheless, the engines are always willing to lend him a hand if needed. Henry caused a lot of grief for the Fat Controller when he arrived in the 1920's, mainly due to the LMS trying to recreate him as a A3 Pacific. He was meant to be a 4-6-0 but was a 4-6-2. At one point, he was the same shape as Gordon, but a terrible accident sent him to Crewe and was rebuilt to resemble the engine Black Five and he felt a lot better. Henry is strong, and always trying to find a way to prove it to the others, Gordon in particular. This unique engine also has a love for trees and wildlife, and spends his free time in a forest that he is proud to call his own. He occasionally still gets sick every now and then. Gordon, being the fastest engine on the Island, is always pleased to brag. He was built in 1922 as a 4-6-2 test engine for the A3 Pacific class. He then got a rebuild at Crewe during the same year before arriving on Sodor. He stalled on a hill between Wellsworth and Cronk and had it got nicknamed "Gordon's Hill." He looks down on the smaller engines, the tank engines especially. Back when Gordon was new, Thomas would often scare Gordon when he was resting between train, and Gordon never took kindly, too which he taught Thomas a great lesson later on. Though as big engines so, Gordon does have the smallest amount of respect and affection for his friends. Once, when Henry was having boiler troubles, Gordon swapped tenders so Henry could have his coal instead. If there were a mirror large enough, you'd most likely find James looking at himself in it. He is an expermental Hughes superheated tender engine. He arrived on Sodor as a black 0-6-0 but became 2-6-0 after an accident on his day and was repainted red to cheer him up, but the new coat did more than that. James is cocky, vain, and often selfish. Though as much as James respects his glorious paintwork, he respects hard work just as much. When James once took Mrs. Kyndley to a funfair, he realised just how good it feels to make a friend happy, and he has never forgotten that feeling. LAST SEEN - Series 12, Saved You! The Steam Team's only female (and proud of it), Emily has a good attitude towards hard work. She is based on the Stirling Single 4-2-0 from the Great Northern Railway. When she first arrived, all she wanted was to show the Fat Controller what she could do, and accidentally took Thomas's coaches by mistake. The engines thought Emily was a thief, and were rude to her. But after Emily saved Oliver and Thomas from a close encounter, she recieved plenty of healthy respect. Emily can be crabby when something is not done right, and when it comes to that, she feels she ought to do it herself. The character bios of the engines that are also owned by Sir Topham Hatt himself, but apparently not good enough for the title The Steam Team. These engines are seen all around Sodor, some even have their own branchlines. Duck is brilliant, and very clever. He is a 0-6-0 5700 Class Pannier Tank engine from 1929 and came to Sodor with the number 5741. His real name is Montague, but was nicknamed Duck for the way his body waddles when he rolls. He prefers Duck, and is very proud of his name. Being from the Great Western Railway, Duck does not stand fuss, and won't take excuses for laziness, especially from Gordon and James! He suffered a lot after a diesel came and tried to get rid of him but was welcomed back to the yards. He was the Tidmouth Pilot up until '67 when he got his own branchline. A little while later Oliver joined his line and he got two coaches of his own. Donald and Douglas are twin engines from Scotland. Each have large tenders, low whistles, and thick Scottish accents. They are 0-6-0 812 Class engines from Caledonia. When work was hard, the Fat Controller sent for one engine, but got two instead. Donald and Douglas were inseperatable, and both feel great surrow when they are each working alone. Their numbers were 57646 and 57647, but their class numbers end at 57645. They mainly work on the Mainline and Duck's Branch Line. It was a good thing Douglas was visiting the Scrapyards that faithful night, otherwise Oliver would be in the scrap heap. He is a 0-4-2 1400 Autotank Tank Engine from the Great Western Railway. Oliver was going to be scrapped by his previous controller, but he manged to escape with the help of Douglas and The Fat Controller. He now has a Great Western green livery, and works with Duck on his branchline. He has two coaches called Isabel and Dulice. He had trouble with the trucks when he first arrived as they pushed him into a turntable, then he accidentally pulled apart their leader, S.C.Ruffey, but that stopped the trucks from teasing him. FIRST SEEN - Series 3, Escape! You'll never meet a more stubborn engine. Daisy is highly sprung, and hates any work that involves moving. She is rude as she is fancy, and doesn't stand strong attitudes towards her fussing. She is a single car Diesel Railcar and was specially built to work on the Ffarqhaur branch. She arrived after Thomas had an accident to do passenger work but caused a lot of upset an was going to be sent away when Thomas came back, but Percy had an accident and she helped out and proved she was worthy to stay and was kept on permanently. LAST SEEN - Calling All Engines! Pranksters at heart, Bill and Ben are the most michevious engines on all of Sodor. They enjoy bumping trucks and but dislike being told off for it. Though Edward and BoCo know how to keep them in order when they are acting up. The two share the work in the quarries and the China Clay Works on Edward's branchline. Quite a few engines have had bad dealings with the two. 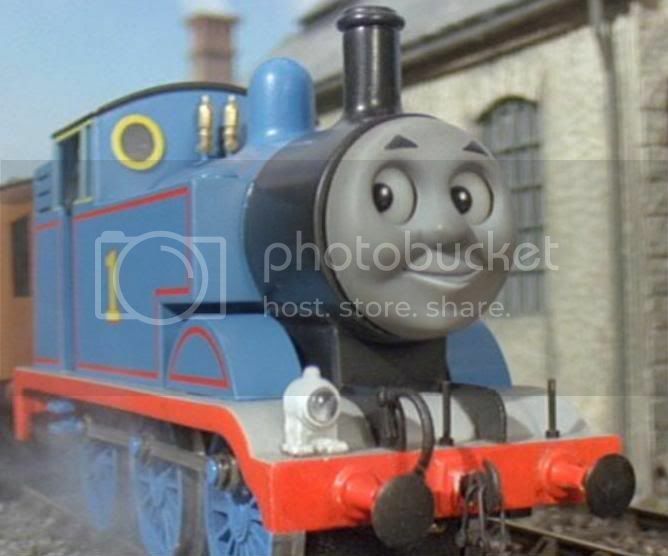 They made BoCo's eyes spin on his first day after they thought he had stole from them, tricked Gordon into thinking they were going to scrap him and caused Thomas a lot of grief when he worked on their line. Though after Thomas saved the day when their line was flooded, the twins vowed not to be mean to him again. Mavis is a tramway diesel that works at the Anopha Quarry shunting trucks for Toby on Thomas's branchline. When she was young, Mavis was fiesty and like doing tasks her own way. She has learned now, and now spends most her time keeping Bill and Ben in order! She is a 0-6-0 Class 03 Diesel Shunter and has her wheels covered by cow catchers and side plates which allows her to go down the track from the quarry to Ffarqhaur without breaking the law. She is very careful going down the line though a car once ran into her due to the driver being new. Arry and Bert are two nasty 0-6-0 Class 08 shunting diesels that work the parts of Sodor that the steam engines dislike greatly. They work at the smelters and the scrapyards and enjoy teasing and scaring the other engines when they go there. Arry and Bert's eyes were mainly on Stepney, and once got the chance to scrap the Bluebell engine, but were stopped abruptly by The Fat Controller. Salty is a BR Class 07 0-6-0 diesel of the dockyards. He is a friendly diesel with a true heart of a sailor. He loves the salty sea air and the sounds of the gulls, and enjoys the blows of ships coming and going. Salty is a hard worker, and knows how to handle the trucks well. Bill and Ben were certainly jealous when they saw Salty and the trucks singing a lively tune! Harvey recieved quite a bad welcome to Sodor as some of the engines thought he looked strange due his crane arm. Harvey was to perform a demontration to the Gentlemen Of The Railway Board, and they would decide if he were to join the railway or not. Harvey wanted to leave as he wasn't wanted, but Percy had derailed and his trucks were blocking the road. Harvey sorted things out and the Railway Board Gentlemen saw it and was brought onto Sodor. He isn't as strong as Rocky but he can lift derailed trucks and coaches and can lift smaller engnes like Thomas and Percy. He is a 0-4-0 Dubs crane engine. Arthur is the largest tank engine on Sodor and is based on a LMS 2-6-2 suburban tank engine. He is a bright maroon engine from the LMS railway, and arrived to the Island with pride. Thomas and Percy envied his Spotless Record, which Thomas accidentally spoiled on Arthur's first run. But he forgave Thomas, and both are good friends now. A few months after his accident, Arthur discovered the new line to the fishing village, in which the job was given to Thomas. After Thomas got into an accident, Arthur exchanged the favour, and took the run. He now runs the line, and Arthur is certainly proud of it. After all, he is the only engine that can stand the smell of fish! Of all the largest engines on Sodor, Murdoch is top. He is a mighty engine with 10 drive wheels and shiny sideplates, which he wears with pride. He is based off one of the huge 9F's Evening Star. Murdoch pulls long goods trains, which he takes through the beautiful countryside. He enjoys his peace and quiet, and was very dissapointed when some noisy sheep were grazing on his line. Molly is a bright yellow engine with very low self esteem. Well, at least, she was when she first arrived. Molly, being shy, wanted to show the other engines she was important, and lied about having special trucks. But she later found out she can be very important as long as she does what she is told. She is based on a GE Claud Hamilton 4-4-0 tender engine. Neville never spoke much. When new, the poor engine had rumors spread about that that he was on the side of Arry and Bert, and was going to derail all the steam engines. This rumor was started by Neville's boxy look and solid black colour, but soon enough, the engines realised that Neville had no bad intentions at all, and is now a friendly engine indeed. He is based on a 0-6-0 Bullied Q1 Engine. Rosie is a chirpy tank engine, who admired Thomas quite a lot when new. She enjoyed copying as he did, but showed she is strong for her size by helping Thomas out of a tight jam. Rosie likes to take on large jobs for herself, which caused her a bit of trouble when delivering the funfair special. Her type is unknown, but we can guess she is an American Class 0-6-0 tank engine. Whiff is a 2-2-4 NER N66 Areolite tank engine and has a very special job on Sodor, and that is collecting rubbish. He is unique in being the only engine with glasses. The other engines thought he was smelly and looked funny, but he proved to be useful when he helped Emily pull some rubbish trucks off Spencer's line. He is a chirpy, happy engine, and proud of his job and doesn't mind the insults. Billy is a Manning Wardle-built L-Class 0-6-0 tank engine. He was excited to arrive on Sodor but didn't like being bossed around. Thomas annoyed him by telling him what to do and Billy hurried away and ignored Thomas' advice and stuffed up all his jobs and caused Percy to get covered in coal. Then Billy ran out of coal and water and Thomas had to help him and Billy agreed to listen to Thomas. Due to his short temper and being careless and clumsy, people often refer to Billy as "Silly Billy." Stanley is a cheerful and helpful Hudswell Clark 0-6-0 tank engine. Stanley was brought to the railway to do Thomas' jobs while Thomas was in charge of the Great Waterton restortation, but after Thomas got into a bad accident, The Fat Controller put Stanley in charge of the construction. Everyone began to adore Stanley and found him to be a great addition to the team. Thomas was awfully jealous of him, but after Thomas came out of the mines, Stanley helped Thomas get back on the track and the two befriended. Stanley now does odd jobs around Sodor. Flora is a new yellow and red 0-6-0 steam tram. She arrived to assist Toby with work, and Thomas thought that Toby would be upset about a new steam tram. When asked to take her to Toby, Thomas kept making excuses and taking her away. But eventually, Toby and Flora met and Toby was relived to have someone to help lead the Great Waterton Parade. At the parade, Flora was given a giant two story coach. She is very kind and befriends easily, though seemed a pit like a pushover. Hank is a big hearted American 4-6-2 Class K4 tender engine. He arrived to assist with wider loads and Thomas was to show him around. Hank commented on Thomas being small and Thomas decided to pull a heavy train by himself. Hank offered help but Thomas ignored him until he became to weak to pull it any further and Hank kindly stepped in. He has a Texan accent and a red cowcatcher in front. He is very helpful though a bit brash and that bothers some engines.